In this life, he remembered again, you must stop your thoughts if you wished to remain intact, or guilt or pity would take everything from you, even yourself from yourself. 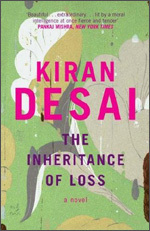 Deep in the misty hills of the Northeastern Himalayas, Kiran Desai’s characters seem sheltered beneath the towering snows of Kanchenjunga. The mountains are rich with butterflies and orchids, land plush enough to feed armies. There are remnants of colonial England, but also a plethora of diversity that includes Bengali, Nepalese, Hindi and Sikh, as their land is a hybrid land, a crossroads of rich life running form Tibet to Nepal, India to Bhutan to Bangladesh, even as far away as Britain. All long and twisting like a dragon leaving her hot and fiery breath across the green earth, her scaly colors slithering through the desperate lives of the lost and the destitute, all those who yearn but just never quite seem to find. Not even love. A wild daring love to bicycle them into the sky, but also a rice and dahl love blessed by the unexciting feel of everyday, its surprises safely enmeshed in something solidly familiar, like marrying the daughter or son of your father’s best friend, and grumbling about the cost of potatoes, the cost of onions. Race is a key here, another overloaded beauty case one just can’t seem to chuck. The clash of cultures, nations, identities. Like all the pungent teas cut above the thick hills of Darjeeling. No one is sure who are what they are any more. Bijou, the son of a cook seeks the American dream in New York but only finds rats and misery on the dirty floor of a restaurant kitchen where he sleeps. Sai, a precocious young girl seeks love with her Nepali tutor but only finds star-crossed tragedy that ultimately leaves her bitter and alone. The world is unfair. Cruel (who’d guess?). People judge people by color, their fathers’ legion, Mothers’ heritage, all the corrupted countries where they were born, all the sick and indelible inheritances that one never really asked for in the first place when they were all thrown into this sad and beautiful and miserable and hauntingly wounded world. Ultimately, sadly, there is only loss. Above it all (and his house high above in the hills), is the judge, now in India but long ago left to study in England where he learned difference and otherness and exclusion first hand. And when he returned he was even more displaced. More other. Not English. Not Indian. Perhaps, in a way, the best way to be: not. Not even able to judge properly anymore. This is why he had retired. India was too messy for justice; it ended in humiliation only for the person in authority … give these people a bit and one could find oneself supporting the whole family forever after, a constantly multiplying family, no doubt, because they might have no food, the husband might be blind and with broken legs, and the woman might be anemic and bent, but they’d still pop out an infant every nine months. Brutal, in a hopelessly brutal world. But there is light high above on the white slopes of the mountains, light as long as one can hold on to each other and love each other, even just for a minute. A son might possibly be reunited with his father. A stolen mutt might be returned. The cord might be cut, perhaps if we unload, if we leave all this heavy, heavy trash behind. We all lose. But at least we all lose together. But so fluid a thing was love. It wasn’t firm he was learning, it wasn’t a scripture; it was a wobbliness that lent itself to betrayal, taking the form of whatever he poured it into. And in fact, it was difficult to keep from pouring into numerous vessels. It could be used for all kinds of purposes.